Stoke Ranch is a unique Santa Rosa landmark. 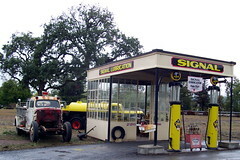 Fred Stoke's collection of oil cans is possibly the world's largest, and his property is covered with other automotive collectibles along with a restored gas station, church, and country store facade. Ask nice, and he just may let you peek inside this personal wonderland.